[Orlando, FL, August 29, 2018] — IOPtima Ltd.—an innovative ophthalmology medical device company based in Israel— has selected bioaccess.™ as its market access and business development consultant to expand its market reach to Latin America. 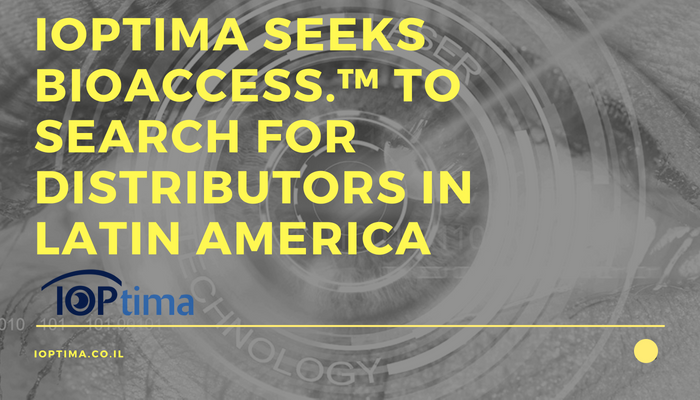 bioaccess.™ will assist IOPtima with searching and selecting distributors in Colombia, Chile, Mexico, and Peru. IOPtima is a developer of minimally-invasive surgical ophthalmic devices. The company’s flagship product, the IOPtimate™, is a surgical system for the treatment of Glaucoma, which utilizes a CO2 laser technology to significantly reduce internal eye pressure (“IOP”), by restoring the natural fluid percolation without penetrating into the eye. With a mission to address the unmet needs and common safety problems in glaucoma surgery, the company has developed a procedure named CLASS (CO2 Laser-Assisted Sclerectomy Surgery). In utilizing the particular properties of the CO2 laser, the IOPtimate thins the sclera wall via ablating surges at the normal eye drainage area (Schlemm’s Canal region), in a simple and highly controlled and specific manner. The IOPtimate system transforms complex and highly risky Glaucoma surgery into a safe, elegant and precise laser-assisted procedure. This elegant self-regulated procedure is possible because the IOPtimate system is designed to achieve functional, simple, safe, reproducible and optimal results from surgery, with minimal side effects and reduced recovery time. At the same time, the procedure is highly efficacious, with a minimal learning curve. IOPtima is looking to expand its market reach to Latin America and considers Colombia one of its key target markets along with Chile, Mexico, and Peru. bioaccess.™ will assist IOPtime with its plan to enter the Latin American market. For this, bioaccess.™ will deploy its local resources in Colombia and the rest of the region to operationalize a distributor search strategy that it will create for IOPtime with the sole goal to ensure patients in Latin America have access to the breakthrough and innovative IOPtimate system. IOPtima is a developer of minimally-invasive surgical ophthalmic devices. The company’s flagship product, the IOPtimate™, is a surgical system for the treatment of Glaucoma, which utilizes a CO2 laser technology to significantly reduce internal eye pressure (“IOP”), by restoring the natural fluid percolation without penetrating into the eye. More information at www.ioptima.co.il. bioaccess.™ is a Florida-based clinical research organization (CRO) and market access consulting company which mission is to help innovative life science companies conduct clinical research and commercialize their innovations in Latin America. More information at www.bioaccessla.com.